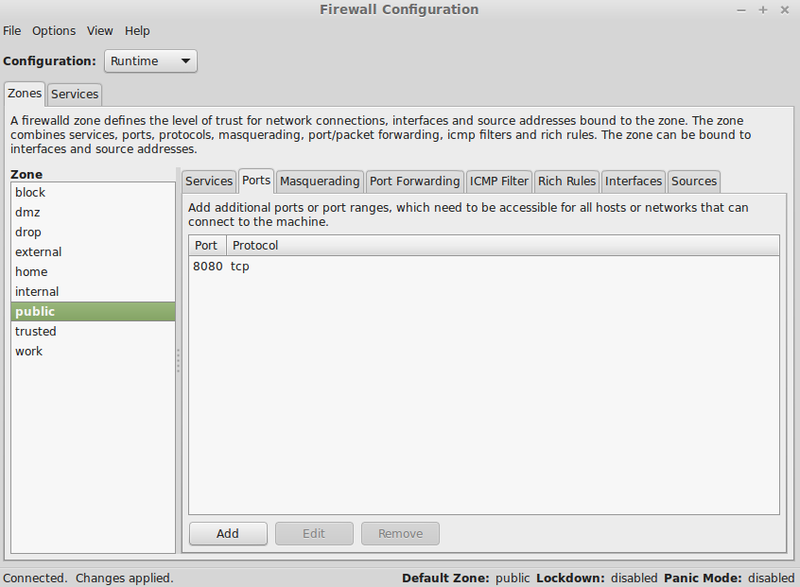 The firewall-config command will open the graphical firewalld configuration utility. You must be using a graphical version of Linux to be able to produce the graphical firewall-config utility. If you are using a text-only environment, use firewall-cmd. 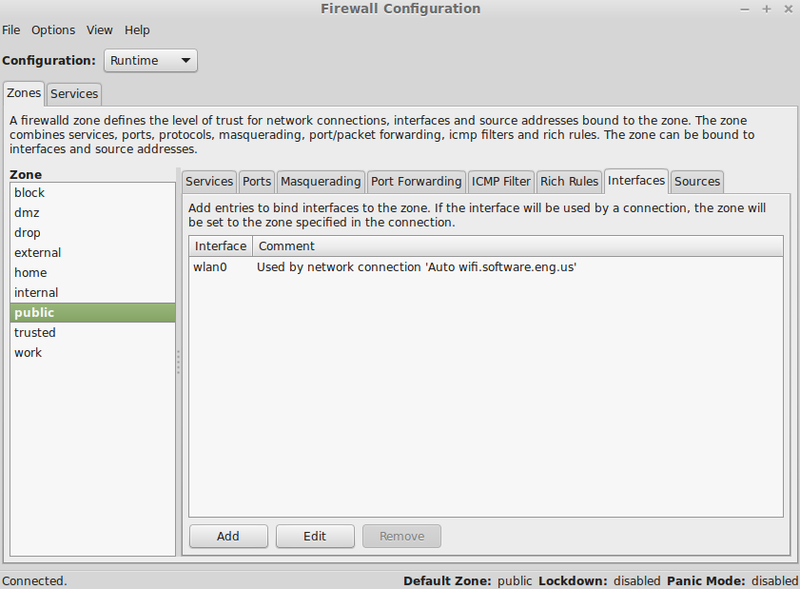 Near the upper left hand corner of the graphical firewall utility is the Configuration drop-down selector. When set to Runtime, changes made will take effect immediately, but will not be permanent. When set to Permanent, the change will not take effect until the firewall is reloaded, and will be permanent. Select Option > Reload firewalld to reload the firewall. Selecting a zone in the left panel of the graphical firewalld utility will display the unique settings for the zone. The default zone can be changed by selecting Options > Change Default Zone. Select the new default zone, and select OK.
Each zone can be bound to one or more interfaces. In this example, public zone is bound to one interface, wlan0. Services can be allowed by simply checking the services that should be allowed. Remember to select Runtime for the change to take effect immediately or Permanent and then Option > Reload Firewall for the change to be permanent. Each service has a predefined port and protocol being used by the service. Select the Services tab, and then select a service to list the port and protocol the service allows. A port can be allowed by selecting the Ports tab and adding the port. By default, the firewall will not be locked down. To lock down the firewall, select Options > Lockdown. Locking down the firewall prevents modification from being made to the firewall. Panic mode will drop all incoming and outgoing packets, and active connections will be terminated after a period of time. To enable panic mode, select Options > Panic mode, and then reload the firewall.